Peanut Allergies on the Rise! The Journal of Allergy and Clinical Immunology reports this month on a study showing peanut allergies in American children have more than tripled over 11 years, from 1997 to 2008. 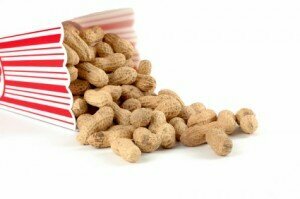 Peanut allergies are one of the few allergies that children do not grow out of, and are also one of the most dangerous. Its increase could be attributable to the “hygiene hypothesis” — the idea that less exposure to allergens and bacteria in childhood leave the immune system underdeveloped and vulnerable, the researchers speculated. Or it could be the timing of when the food is introduced, or how the food is prepared, the researchers said. Roasted peanuts, for instance, have increased allergenicity because cooking changes the nature of the proteins in the nut. This increase in allergic response is despite the American Academy of Pediatrics’ original recommendation of delaying a child’s introduction to peanuts until the age of three, which was later rescinded in January 2008. They now recommend that solid foods not be introduced before four to six months of age, but that the timing of introducing common allergens (such as dairy, eggs, and nuts) is no longer believed to have an impact on a child’s later probability of developing allergic diseases. In fact, a study involving Jewish children in the United Kingdom and Israel found that the Israeli children who were exposed to peanuts frequently during infancy were 10 times LESS likely to develop a peanut allergy than their UK counterparts. Food allergies such as nut allergies are on the rise and have become a significant health burden. There are many alternative and holistic options for dealing with allergies such as a peanut allergy. Contact a BioVeda Health and Wellness Center near you to learn more.